The walk is circular, so can be joined anywhere. 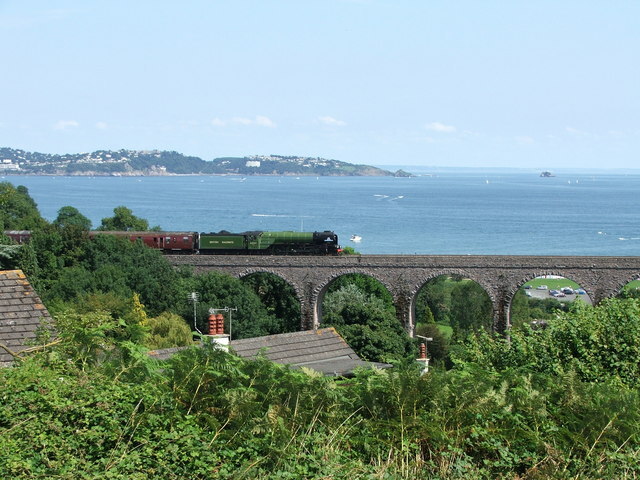 If using public transport a good starting point is Churston Station, which is served by a frequent bus service and also by the Paignton and Dartmouth Steam Railway during the summer. If arriving by car a good starting point is Broadsands beach, which has a large car park, and that is the start used in this description. The route is waymarked – look out for the colourful little waymark plaques featuring a boathouse. Buses on the main seafront route between Torquay/Paignton and Brixham pass Churston Station. Broadsands: car park, toilets, refreshments; Churston: pub and restaurant; Churston Station: buses, trains, pub; Galmpton: shop, pub; Greenway: car park, gardens, toilets, refreshments. There are two stiles; a number of minor ups and downs, but these are generally steady gradients rather then steep slopes; one major road crossing where care is needed. Landranger (1: 50,000 scale) no. 202 Torbay and South Dartmoor. The walk starts at Broadsands Car Park. Which is on the coast of Torbay between Paignton and Brixham, and is signed from the main coast road. There is a stone building at the far end of Elberry Cove. This was an early bath house, built for the local Lord of the Manor when sea bathing became popular in the 1700s. There are colourful Greenway Walk waymark here. These should guide round the whole walk. The unusual design is by Devon artist Brian Pollard. Over a wall can be seen the tower of Churston Church. Just beyond in the same direction is Churston Court. Now a pub and restaurant, this is an Elizabethan house in origin, and the church is even older. These mark the centre of the original Churston village, and may be visited by walking along the road ahead. There is a bridge along the walk which once carried the Brixham branch line railway, unused since the 1970s. Note the number on the bridge indicating that it is 225 miles and 22 chains from the old GWR terminus at Paddington. 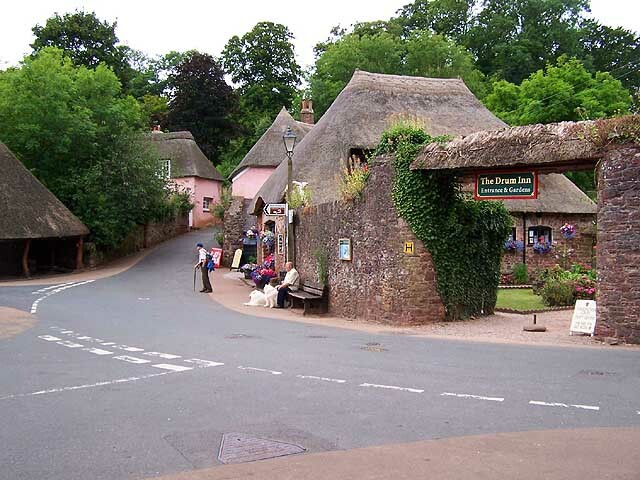 The village of Galmpton was recorded in the Domesday Book (1086), it was once a very isolated agricultural community. After becoming important for its limestone quarries, it has now become an attractive outer suburb of Torbay. After a while the attractive green lane, Combe Lane crosses a stream then climbs up the side of the valley, or combe, which gives it its name. Nearing the top look across the valley to spot the unusual tree on the skyline, a cunningly disguised telecommunications mast. 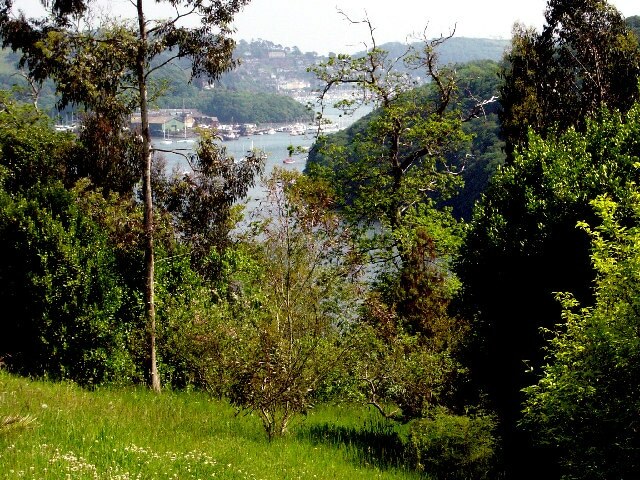 A superb views open up on the right over Galmpton Creek, which is an inlet of the River Dart which will be experienced more closely later in the walk. There are also views over the Dart itself and, further round, Galmpton village and Torbay beyond. The Youth Hostel is a Victorian building. It was built by the Simpsons, a family which owned an important boatyard just down the river; it is said the house was built here so they could keep an eye on things at the yard. You will pass the line of an ancient trackway which led to the crossing point of the Dart between Greenway and Dittisham. Today it gives magnificent views down the Dart. Noss Boatyard, originally the Simpsons’ business, is immediately ahead on the left, with Dartmouth and Kingswear beyond. Look out for the information board referring to the Dart Valley Trail, which also uses this path. Greenway Gardens is a fascinating location, originally the home of Sir Humphrey Gilbert the founder of Newfoundland, and in the 20th century home to Agatha Christie. There is another splendid view over the Dart featuring the village of Dittisham on the opposite bank. You may just notice the chimney along the walk. This was for a 19th century steam engine which powered the most up-to-date farm machinery of the time. Limekiln burnt limestone taken from the quarry on the far side of the creek, the burnt lime being spread on the fields as a fertiliser. The limestone was also used as ballast in early ships sailing to Newfoundland, and the Galmpton Creek limestone has been found in early Newfoundland buildings. This is the same stream as was crossed in Combe Lane earlier. It was once used to power Galmpton Mill, seen ahead at the end of the beach. Boatbuilding has long been an important industry on Galmpton Creek, including trawlers for Brixham and small craft for the Navy during the Second World War. The name Warborough comes from the Saxon words for “watch hill”, and this open area is still a good vantage point to see over the bay. On the left are the remains of a windmill. It dates from the time of the Napoleonic Wars, when an increased demand for flour led to its building.